The genkan area of my school. High school in Japan is so very different from the way it is in Canada, and not just because I graduated more than ten years (!) ago. The two schools I attended as a teenager were technologically on the cutting edge, and we had a beautiful computer lab where I used to check my email at lunch every day (Yes - it was 1999! ), a media room and a modern cafeteria, and LCD displays in the halls so that students could read the daily school news. As a student, I learned Microsoft PowerPoint by helping my friend Kelley with the daily media broadcast. Japan was a bit of a nudge backward. 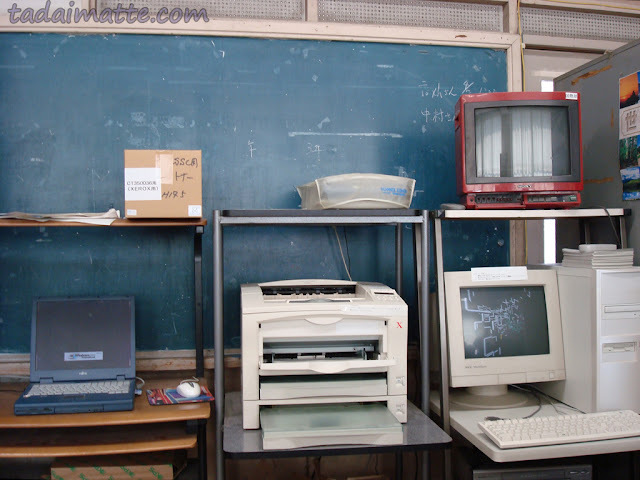 I remember palpable dismay when I took the tour of 〇〇 High School and discovered - no computer lab, and just two general-use Windows XP laptops in the English department. As an expat excited to share her adventures, and soon enough struggling with homesickness, Facebook had become my lifeline. I needed Internet access. Luckily, we kept one of the general-use computers on the desks next to mine so I could pull it over whenever I wanted. Which...was a lot, given that there wasn't a lot of prep work for me to do when the students were on vacation, so I spent quite a lot of time on Wikipedia, Canadian news websites, and eventually, teaching myself the sport of basketball from the ground up. One day I came to school and, bless whoever in the IT department allowed this, found that the laptop had moved permanently to my desk and a third one lay in its former home. Mari, you are a lifesaver. My neighbours sometimes indicated that they thought I was a little unsociable, but my sanity was intact! Anyway, at my school in Japan, things worked much like it did when I was in elementary and junior high back home; we had overhead projectors, analog clocks and no heat. Wait! That last one's not right. My biggest problem at school was, bar none, the lack of insulation and heating. Mind you, this was not an issue unique to school; I battled frozen extremities at home, in the train station, and really most other places as well. I'll cover that in another post someday. To stave off the cold, I had an enormous gas stove in my classroom, which needed to be hooked up to the gas outlet in the wall and turned on a minimum of twenty minutes before the lesson. On days when my prep work took me right to the bell, myself and the students could hardly function for the first half of the lesson, so I often spent entire mornings in my classroom, reading books and breathing gas because it was better to have a migraine than to be so cold! 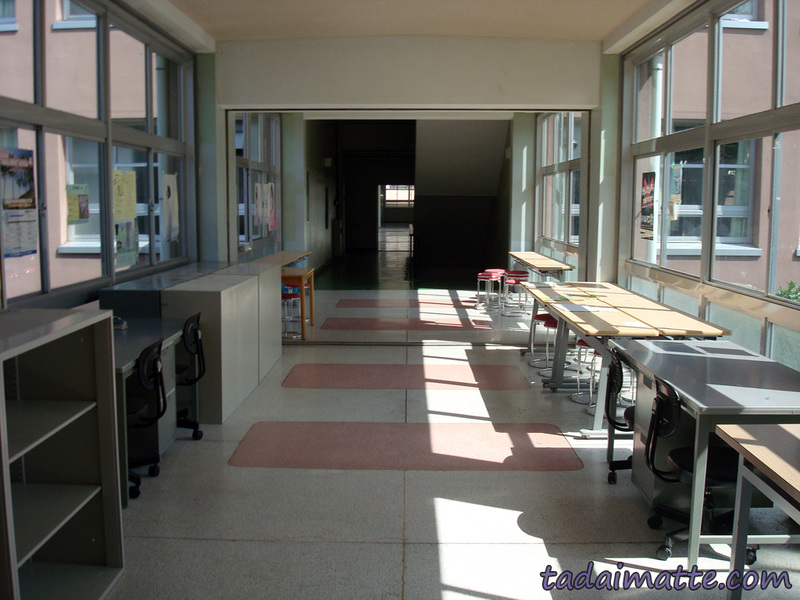 My desk was also by the window in the staff room, and we usually kept it open in winter so that the air could circulate...even in February, that window was always open. The school was built in the 1960s, and had a definite 60s feel to it. There was a staff photo pinned to the cabinet behind where I sat that was dated the year Heisei 6 or so (2012 is Heisei 24) and showed the school exterior painted a vibrant hospital green. We had a chalkboard in the English department that had the names and addresses of JETs long, long gone written there - I wish I had taken a photo of this before I left. One of them had my phone number, since it had been handed down year after year with the apartment. I was always on the lookout for 'vintage' things at home and away, and school occasionally delivered. I loved the sign in our lounge citing the rules, dated 1984, that hadn't faded or yellowed a bit. I thought much of the charm in my school lay in its history and when I visited Emily's OO N High School on multiple occasions, a building not even 5 years old, I knew I preferred ours, even though she had air conditioning and heat in the staff room! This entry has turned into a bit of a ramble, but when I think about how high school here in Canada must have evolved since I graduated (I hear my alma mater now auto-emails parents whose children have not shown up for school, and all papers submitted are typewritten) I'm glad that Japan was not a culture shock for me in this way. My students didn't work up any fancy Photoshop projects, and they handed all their homework in hand-written. I kept my grades in a register book, not on my computer. The kids all had cell phones, but rarely did I see much other technology in class - sometimes somebody would have an iPod tucked into their blazer as they left, but lunchtime was usually for socializing with friends! I knew by name the only girl who brought her Nintendo DS with her to school every day, because she once asked me to bring mine so that we could play together. 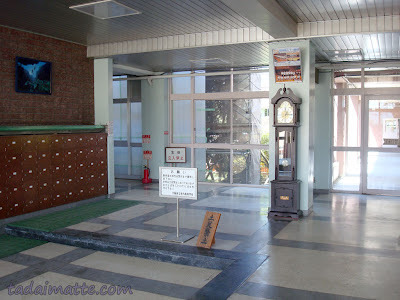 Maybe it was because the prefecture couldn't afford fancy computers and LCD screens, but I prefer to think that they were subscribing to the "we got along perfectly well without those things up until now, so why does it matter?" logic. I'm no technophobe myself, but I really found it refreshing that my school was so down to earth. Even though we have had all these great advancements, the Japanese still sometimes see them as distractions. In my school, and I suspect this was true of many Japanese schools, we kept things simple. We had rocks, and we liked 'em!